Save Maumee Grassroots Organization invites you to a collage of music, art expression and activism at their Wine and Canvass Art-N-Party fundraiser on February 25, 2017 from 5:00 PM to midnight at The Phoenix, located at 1122 Broadway, Fort Wayne, IN 46802. 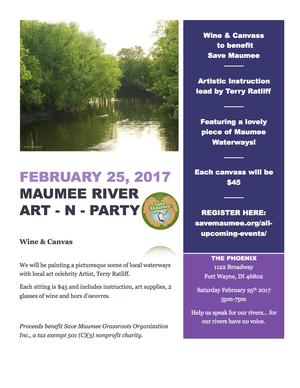 Save Maumee is teaming up with local artist Terry Ratliff to assist participants in painting a beautiful Maumee River landscape. The Wine and Canvass event will take place from 5:00-7:00 PM, with music following directly afterwards. Local musical talent, the Grateful Groove and U.R.B., will take to the stage for a night of music that will make you shake-a-tail feather! This is an all ages venue, so please bring the kids to participate in the Cookies and Canvass from, 7:00 -9:00 PM in the foyer with dancing all night! Raffle tickets for a silent auction will be available for purchase throughout the evening. The group gives many thanks to the local businesses that have donated items to help raise money for upcoming restoration projects. Whether you buy a t-shirt, plant a tree in your name, or join any of the 3-day Earth Day Celebration coming up in April, the work could not be done with out everyone’s support. 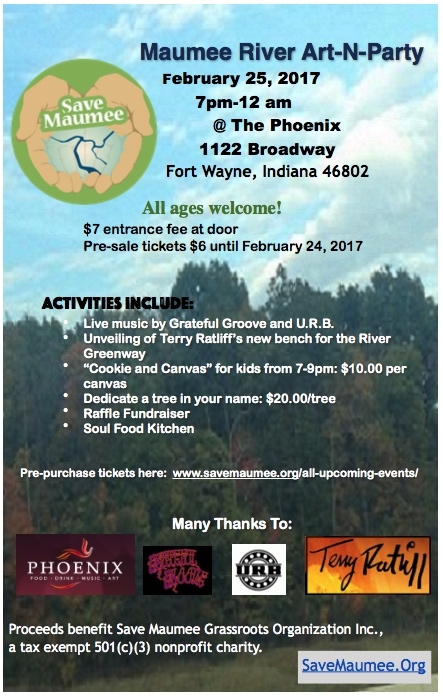 As part of the fundraising event, Save Maumee will be donating a handcrafted, up-cycled bench to local painter, Terry Ratliff. The bench will replace the Rat Art bench that was destroyed by vandals last summer, and it will be placed along the St. Mary’s River. Ticket prices range from $6-$45 and can be purchased by visiting http://savemaumee.org/all-upcoming-events, or at the door the night of the event. Save Maumee is raising money to match a federal Great Lakes Restoration Initiative (GLRI) grant through the U.S. Forest Service, to replant the most degraded ditches in the upper Maumee watershed in Allen County. The group is working to plant 2,780 trees by the year 2018 and plans to plant 1,100 trees over Earth Day weekend alone. The public is invited to help during their 12th Annual Earth Days. The usual Earth Day will be transformed into an entire weekend, April 21, 22, 23 in the Spring of 2017! Save Maumee has partnered with New Haven Parks and Recreation to replant floodway areas along Moser Park and Heatherwood Park in the Trier Ditch subwatershed, which flows directly into the Maumee River and they are requesting your help. Save Maumee is a non government organization with a mission to preserve, protect and improve the ecosystems of the Upper Maumee River and watershed, by increasing public awareness through advocacy, collaboration, education and hands-on projects. The U.S. Forest Service is a equal opportunity lender, employer and provider. 7-10pm Raffle with prizes from a range of local businesses! YMCA memberships, Fort Wayne Children’s Zoo passes, Healing Hands Massages, basket from Polaris Project, Jain’s Herbal Apothacary salve, Jerrod Tobias Art, trinkets, jewelry, food items, Gift Certificates from Hall’s, Salvatori’s, Lucky Terrapin Grill and more coming in daily! THANK YOU FORT WAYNE! Raffle tickets are available for purchase at the event, and many other ways to make this fundraiser a success! *Consider planting a tree in you or your family’s name with a frame-able certificate for $20.00! 7-9pm Grateful Dead like you have never heard them before! These musical artisans will get you up and groovin’! 10-12pm U.R.B. with Dave P. will be jamin’ it out like they are going to get down..and make us all dance. Story of the Bench being unveiled and dedicated at Save Maumee’s Art-N-Party. Save Maumee’s 12th Annual Earth Days…because one day is just not enough to plant 1,100 trees CLICK HERE to see three day event details for Earth Day, April 21st- 23rd, RAIN OR SHINE! Save Maumee’s Riparian Buffer Initiative, Planting 2,780 trees between 2016-2018 along the banks of the most degraded streams that flow into the Maumee River. Want to know how we Save the Maumee? VIDEO HERE demonstrates a great example of our work within Six Mile Creek, Koester Ditch, where volunteers planted 460 trees in October 2016. Special thanks to Patty Hunter of Public Access Program, Patty’s Page. Become a Save Maumee Member and receive a tax deductible receipt today! CLICK FOR MEMBERSHIP. Thank you for supporting our work to improve water quality in the Maumee River through tangible, boots-in-the ditch projects or financially supporting them! Warm Regards and look forward to seeing you on February 25!